The Easy Dry Food Dehydrator uses heat to remove moisture from food to prevent the growth of microorganisms to increase shelf life and give a new sensation to food. Dehydrate food to supplement a dish, to eat it, or to store it and re-hydrate it for later cooking. 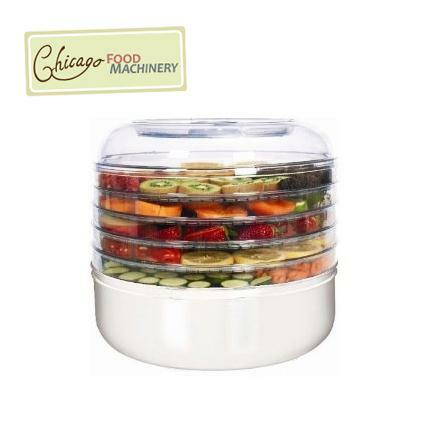 The Easy Dry Food Dehydrator can be used to dehydrate fruits, vegetables, jerky, herbs, nuts, bread, flowers, and almost any food imaginable! Save money and time by creating your own healthy or low carbohydrate snacks quickly and easily at home with the Easy Dry 5-tray food dehydrator. It's a snap to whip up a batch of beef or turkey jerky, banana, pineapple or apple snacks, dried vegetables or herbs, homemade yogurt - or so much more.